A childhood cookie made after we use to go wild blueberry picking in Upstate New York. We have so many recipes when it comes to fresh berries of all kinds, here is one of our favorites I am sharing and hope you and your families love it too! There is a little part of me that says this is a little like a min muffin cookie, or a mini scone modern day, with the texture and flavors. They are not too sweet and great with tea, perfect for those who don't want loads of sugary sweet cookies. This is a wonderful alternative. The kids loved them when they were little and still as adults, I almost forgot about this one, so here it goes! These cookies are a soft, moist cookie with blueberries inside. They are not too sweet of a cookie, they remind me a little of a sweetened cake-like cookie with frosting. I really love these to bring to the beach in the summer unfrosted. You can eat them either way. I frosted them for a festive 4th of July look, but they really don't need a thing! These easy blueberry cookies are just delicate in flavor with a hint of lemon and cinnamon flavor. The perfect summer blueberry cookie that anyone can make. Heat oven to 375 degrees. Prepare a cookie sheet with either parchment paper or sprayed with cooking oil. Beat the sugar and butter and shortening together until light around 2 minutes. Add all other ingredients except for the milk and blueberries, adding milk a little at a time until blended. Fold in the berries. Drop by tablespoons onto the cookie sheet and bake 12 to 15 minutes until set in the middle and edges begin to brown. For frosting these all I do is mix powdered sugar and water to make a thick paste. I take a flat style knife to spread of the top while still warm and sprinkle with colored sugar. Nothing like a recipe that brings back childhood memories! 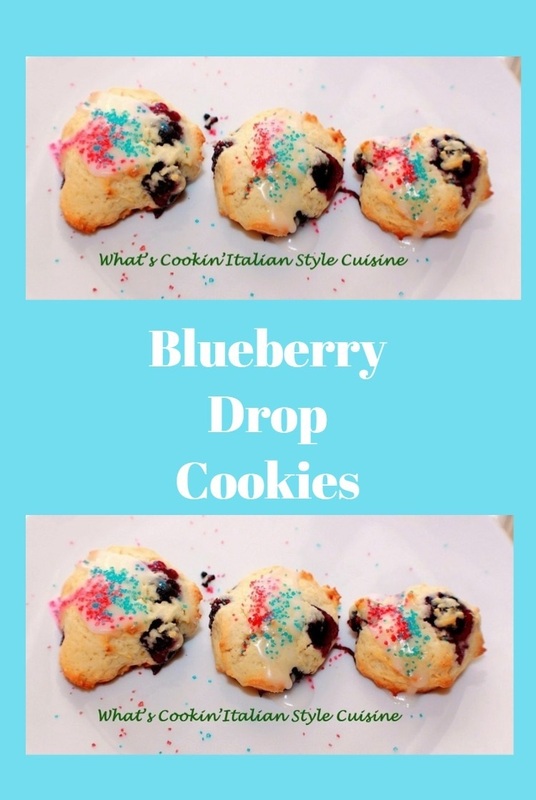 Your blueberry cookies look so good! Thank you for sharing!